Last week, the West was gripped by a fierce heat wave. High temperatures grounded airline flights, fueled forest fires, matched or broke records in places like Death Valley, Palm Springs, and Salt Lake City, contributed to sickening hundreds -- at least 34 of whom were hospitalized -- and were responsible for at least one death. 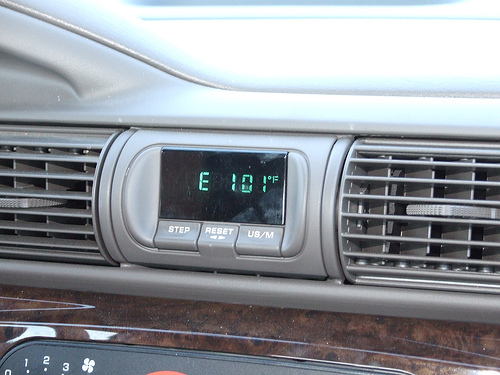 It was so sweltering that two National Weather Service employees baked cookies inside a car. Prolonged hot streaks like this can wither crops, buckle roads, cause train derailments when metal tracks warp in the heat, and trigger power outages because of the high demand for electricity. But the most profound effect of unflaggingly high temperatures is on our health. It exacerbates air pollution, which makes life difficult for sufferers from asthma and other respiratory conditions, and can cause heat-related deaths and permanent disability, such as neurological damage and a worsening of conditions like kidney and heart disease. Heat waves disproportionately affect the most vulnerable members of society, the elderly, the very young and the poor, who often have no way to escape the heat. Growing scientific evidence indicates that these kinds of hellish hot spells have become far more likely to occur because of global warming. Within the next thirty years, exceptionally long heat waves could become the norm, particularly in the American West, according to one 2010 Stanford University study. Stanford’s climate models predict that by 2039 Utah, Colorado, Arizona and New Mexico could swelter under intense heat, with temperatures equal to the hottest seasons on record in the last half of the 20th century. Researchers likened that environment to Europe’s 2003 heat wave that claimed 50,000 lives. Overall, the frequency of so-called extreme weather events in the U.S. -- when temperatures climb past 100 degrees -- could triple over the remainder of this century, research by University of Miami scientists showed, resulting as many as 150,000 deaths between now and 2100. The rapid growth of cities will further amplify the effects of rising temperatures because of the urban heat island effect, in which the engineered infrastructure, with its asphalt and black top, retains and radiates heat (more on this in a later blog). Already, heat waves claim about 658 lives in the U.S. in an average year, and about 1,800 people perish from illnesses exacerbated by heat stress, including heat exhaustion, heat stroke, heart disease and kidney disease, which is more than the death toll from all other natural disasters. Yet heat waves are considered silent killers, George Luber, associate director for climate change at the Centers for Disease Control and Prevention in Atlanta, told me in a recent interview for my book, Fevered, “because they do not leave a trail of destruction in their wake.” While hurricanes, fires or floods can result in demolished homes and scorched land, the visible evidence of health-related damage from heat waves disappears once the hot spell is over. Heat cramps are normally the first sign that the body is having trouble coping, and are typified by severe cramps in the legs or stomach, exhaustion or dizziness. Heat exhaustion is far more serious, and is caused when the body loses fluids through heavy sweating from either vigorous exercise or being trapped in a hot, humid place. If victims aren’t treated quickly, heat exhaustion can swiftly escalate to heat stroke, which can be life threatening because our natural cooling system fails, and we stop sweating, causing body temperature to shoot up to 106 degrees or higher. While heat stroke can be resolved with immediate medical attention, even victims who receive medical care in time may suffer permanent damage. “The elderly and the very young are the most vulnerable because they’re not able to cool down their bodies efficiently because they don’t sweat as much,” Luber explained. What happened during Chicago’s deadly heat wave in 1995 provides a cautionary tale. More than 700 people perished, and many of those who were hospitalized had long-term health consequences, such as worsening heart disease or kidney failure, according to subsequent research. What’s more, nearly half of the heat stroke patients who were rushed to the ICU died within the year, according to the same study, while one-third were permanently disabled and unable to live independently. But cities across North America, including Philadelphia, Chicago, Toronto, Atlanta, Phoenix and New York, have adopted coordinated warning and emergency response systems to safeguard the public during heat waves, including opening cooling centers, activating outreach programs to check on the elderly, shut-ins and the homeless, and beefing up staffing for paramedics and other emergency crews. “We can’t prevent the heat waves,” says Luber, “but we do know how to stop the loss of life.” But will they be enough if triple digit temperatures become the summer time norm? Linda Marsa's book FEVERED will be available on August 6, 2013, wherever books and e-books are sold.